Sometimes I wonder to myself -- are we invisible? At the age of 85 my mother was a real dynamo. Unique. She lived on her own, paid her own bills, and took care of herself. She had been doing this for more than ten years since the death of my father. She was on her own. I actually wrote this article in 2009. I thought that those of you who are still on your caregiving journey might find the perspective of interest. Believe it or not, we still have readers who first subscribed in 2009, or early on. I hope you will enjoy the picture of Dotty - she was 95 years old at the time. I still think of my mom as the dynamo she was. My mother was often spotted walking to the pool in her community. A tiny women the senior citizens all around her marveled. They drove to the pool she walked. Our neighbor Lidia still laughs when she talks about seeing my mother, out her window, taking off for the pool. She laughs harder when I do my imitation of my mother walking through the grass -- later in life she walked like a penguin. It seemed as if father time had forgotten about my mother. There was no limit to what she could do. Walk 20 blocks, no problem. If you asked if she wanted to go with you anywhere, anytime, she was out the door. Up at dawn and awake at midnight my mother was amazing (people often ask me how I do it, how I have so much energy -- genetics). My mother was very funny, a real character. She made people laugh and smile. You never knew what was going to come out of her mouth next. My mother read the newspaper daily, did the crossword puzzle and watched CNN. She followed the O.J trial like a hawk, and every time I called her she asked -- What do you think? She had her own opinions to share. She had opinions on everything and wanted to know your opinion. Old or New reader you might find this articles of interest. My mother was a wonderful person: always welcoming people into her home. She was noted for her great Italian cooking. 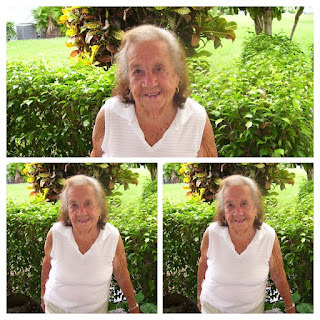 When people came to Florida, they would go over and visit my mother and eat her Italian cooking. I remember as a kid that all of my friends really looked forward to staying over our house. Donuts, spaghetti and meatballs you name it. Ravioli anyone? My mother was a real character (she still is). I was there with my mother when my fathered "passed away'; this was when I really started thinking about my mother's longevity, her health. I was thinking about her for years knowing that someday she had to live with one of us (I have a brother and sister). As the years flew by I started to think about it more and more. She just kept going ang going without a health problem of any kind. Rarely a minor illness. But, I knew in my mind that sooner or later father time was going to catch up with her. At times, my brother, sister and I had discussions about putting my mother into some kind of "facility". To be honest, to be honest now, I knew I would never be able to do it. I promised my father not long before he died not to worry. I promised him no matter what, I would take care of his wife of 55 years, my mother, our love, Dorothy. It was not a promise I made haphazardly. It seemed as natural to me as breathing. I already knew in my mind and my heart, I was the one. I knew the day would come. I just didn't know when. Or how. And then it came. Alzheimer's struck like lightening. I guess people decided they didn't want my mothers's Italian cooking any longer. Sometimes I wonder to myself -- are we invisible? We live our life one day at a time.